Editor’s note: You may have missed this article when CMI published it last year. We’re sharing it now because the misperceptions about editorial calendars and content marketing strategies are still common. 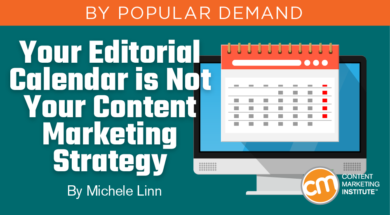 Marketers often talk about how they have a strategy … then proceed to say they are set because they have an editorial calendar. While this conflict may seem like semantics, the meshing of these terms points to a bigger issue. You need to have both a strategy and an editorial plan or calendar. And you need to understand how they differ because the absence of one may explain why you are experiencing uncertainty in your content marketing efforts. Let’s say you are building a home. An architect leads the design of the structure by creating an architectural plan. But a civil engineer makes the design possible – implementing and adjusting the plan to realize the architect’s vision. Do you need an architectural design for your new home? Absolutely. It’s the vision of what you want to achieve. You help your architect understand your needs (your why) – your strategy. Where do you want to move? How big do you want your house to be? Do you want room to grow or something more compact? How much do you want to spend? These are some of the questions you need to answer before the architect creates a plan for your house. With that architectural strategy, the civil engineer can create a building plan to implement the vision. That’s akin to your editorial plan or calendar. If your editorial plan isn’t feeling quite right, chances are you don’t have a solid strategy – or your team doesn’t have a shared understanding of what that strategy is. But not enough of their strategies have a content mission, a deep understanding of their personas, and goals tied to their content. If you don’t have these things, something is going to feel off. And, while your strategy typically comes from the leadership team, don’t make excuses if you don’t have one. Does everyone on the team have the same understanding of the strategy? Ask your fellow team members the three questions above and see how consistently everybody communicates the strategy. Post simple answers to the three questions on each team member’s wall (or close by). You want team members to internalize the answers. I can’t stress this enough: If you don’t stick to your audience and mission – with a focus on your goals – you will flounder. Unlike your plan, your strategy is relatively set in stone and won’t change often. Each item you publish and communicate needs to support the three key items in your strategy. Every. Single. Thing. And that’s where your editorial plan comes in. As you can see, all these details are tactical and important. A high-level strategy is necessary, but without an editorial plan to support it, your content marketing program will have a tough time gaining traction. Want help in designing and building your content marketing home? Or maybe it’s time for some renovations. Register today to attend Content Marketing World Sept. 4-7 in Cleveland, Ohio. Use code BLOG100 to save $100.